Appetizers and pizza don’t really belong together. I mean, you have everything you need on top of a, hopefully thick, crust–red sauce, one or many cheeses, the best veggies, and maybe some sausage or pepperoni. Every food group. So practically speaking, no appetizer needed. But say you’re having a pizza party, which has been on my to-do list ever since reading about it in Bon Appetit’s party issue. Munching on something while you start with drinks and bake everyone’s customized pizza 45 minutes later than planned is essential. I think there are some partygoers out there similar to me, always sure to have a snack before leaving the house, but then again, there are the more relaxed among us, such as my fiance, who take the “wait and see” approach. Unless you’re hosting a frat party, it’s in everyone’s best interest to avoid having the latter guest type drink half a bottle of champagne as their appetizer. With that scenario in mind, I give you white bean stuffed mushrooms. After spending half the day rising and kneading pizza dough, the last thing you need is a complicated appetizer that takes over an hour to prep. You do have to shower and get ready at some point, after all! These little handheld, one-bite (read: no juggling your drink and a plate and then trying to awkwardly shake hands with a stranger) cuties are filled with fibrous beans, not gluten-y breadcrumbs and fatty sausage, to hold over all your guests, leaving you at ease to enjoy the festivities a bit before you head back to the kitchen. You won’t be left sweeping for napkins and bones or cleaning a crockpot, a la buffalo wings starter. They’re packed to the brim (actually, above the brim) with salty parmesan, tangy blue cheese, healthy spinach, spicy red pepper flakes, and shallots and garlic for an extra flavor boost, all browned and bubbly fresh out of the oven. Okay, so say you’re not having a pizza party. I much prefer pizza to turkey, but you and I both are probably more likely to start making the holiday party circuit right about now. At risk of blowing up my spot this season, I’m an extremely selfish food-bringer. I jump at the chance to bring an app, but usually it’s something I want to hoard while I hide out in the corner with my wine (oh hey, introvert). I’ve had plenty of holiday party fails, from monopolizing the host’s stove for 30 minutes while my caramel sauce didn’t thicken to a baked brie served in its burning hot pie plate that might have sent people home with second degree burns (luckily they didn’t feel it at the time). Even the home runs weren’t perfect, because anything covered in maple syrup in a crockpot is a pain to transport, tote home, and clean around 2 AM before it gets crusty. 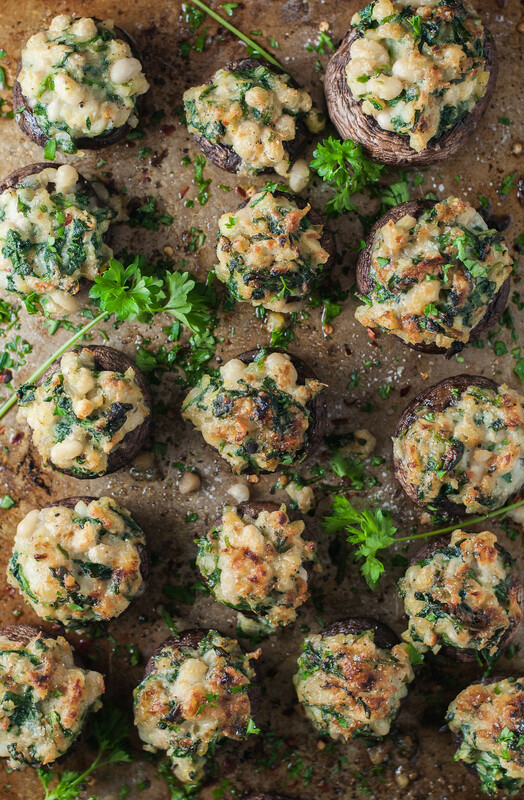 All that being said, these cheesy bean-stuffed mushrooms are also simple to transport. Just throw them into a 9×13, steal under 10 minutes of oven time from your host, and you’re set! No utensils, no cutting, no cleanup. Just throw the pan into the car (or taxi–safety first!) and even wait until the morning to wash out any residual mushroom juices. With all this pizza talk, it’s going to be hard to resist an early Thanksgiving pizza party when my sister and her husband join us in a week and a half to celebrate. That seems like forever away right now, but I need to get menu planning! It’s one of my favorite cooking related activities–seeing how many favorites and comfort foods I can pack into a big feast–but it seems so far away still. My time right now, including some very late nights, is dedicated to a fun, but secret, project. I’m all for surprises, but I really wish I could share it at this point. And no (Mom), it’s not a surprise early wedding. Or a dog. Stevie is also in the home stretch of a huge work project, working some very strange hours. Yesterday he left the house around 2 PM, and he’ll be staying late Friday. More time for me to work on my to-do list? And drink wine, which makes everything better. The weird schedule yesterday did allow me to enjoy lunch on the couch with my honey, but not before putting the finishing touches on a recipe for meatless steakhouse quesadillas and a punchy avocado sauce. What does punchy taste like? Maybe some lime. Some worcestershire (weird, I know). And some things that you’ll just have to wait to find out more about. Suffice it to say, Steve requested a second ‘dilla before taking off for a lovely evening in Jersey. Gotta keep him well fed! 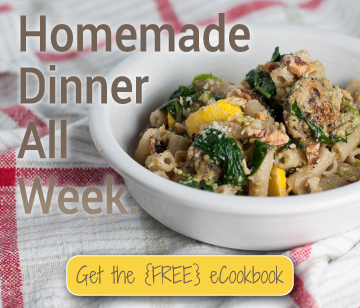 The recipe will be up by Saturday at the latest, in time to prepare for another delicious meatless Monday. 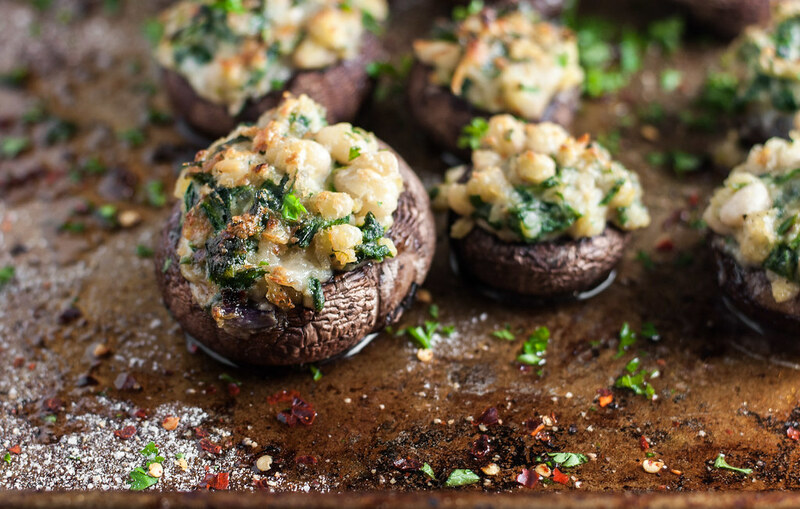 Mushrooms stuffed with meatless filling and no breadcrumbs are satisfying and flavorful, but not so rich as to spoil a heavy main course. Make the white bean filling ahead of time for a quick, portable party appetizer. Turn on broiler, if it requires pre-heating. Scrub and dry tops of mushrooms. Remove stems as cleanly as possible. Place mushrooms, with dome/top facing up, on a baking sheet. Drizzle with 1 tablespoon olive oil and rub caps to coat. Sprinkle with salt and pepper. Cook about 3 minutes, 4 to 6 inches from broiler. Mash 1 cup beans and 2 tablespoons olive oil together with a fork or potato masher. Roughly chop remaining ½ C beans and add to mashed beans. Heat ½ T olive oil in a skillet over medium. Add shallots and red pepper flakes and cook 3 to 4 minutes, until softened. Add garlic and cook another minute, then add spinach and cook until wilted. Turn off heat and immediately transfer spinach mixture to bowl with beans. Once cooled slightly, stir in blue cheese, parmesan, ½ teaspoon salt, and ¼ teaspoon pepper. Taste adjust seasoning, if needed. Flip the mushroom caps so the cavity faces up. Sprinkle with salt and pepper. Scoop a heaping tablespoon of filling into each mushroom cap and use your fingers to press it down into the cavity and form it into a mound. 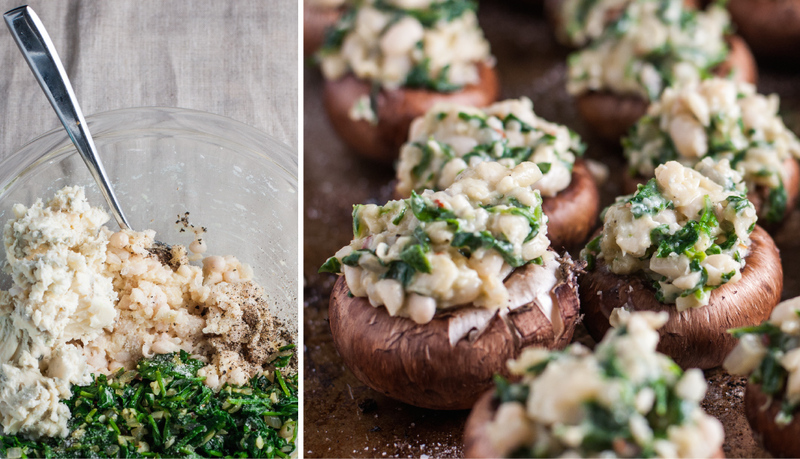 Drizzle the mushrooms with olive oil. Place under the broiler for another 6 to 7 minutes, until starting to bubble and brown. Cool a couple minutes before serving warm. 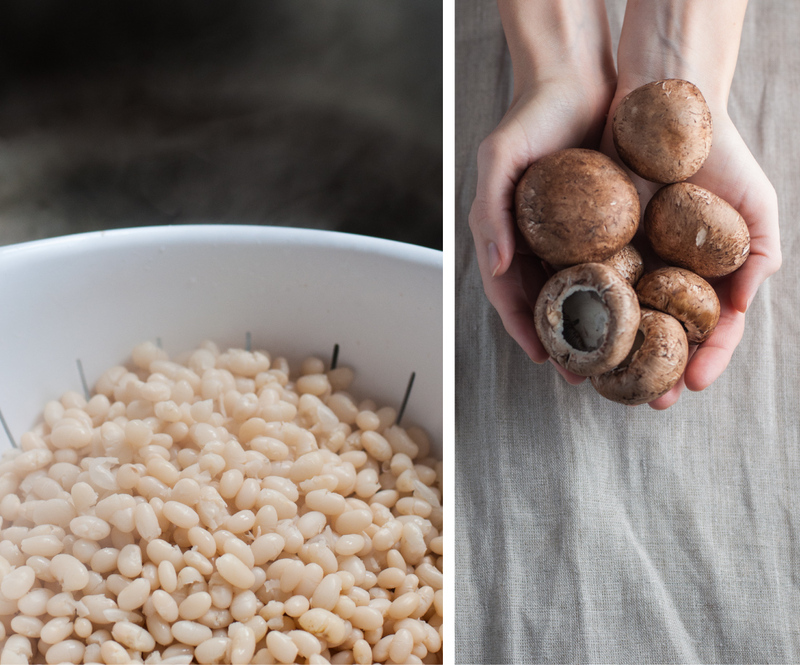 Use the same cooking method to fill 2 or 3 portobello mushrooms with the white bean mixture, serving as a vegetarian entree for two. 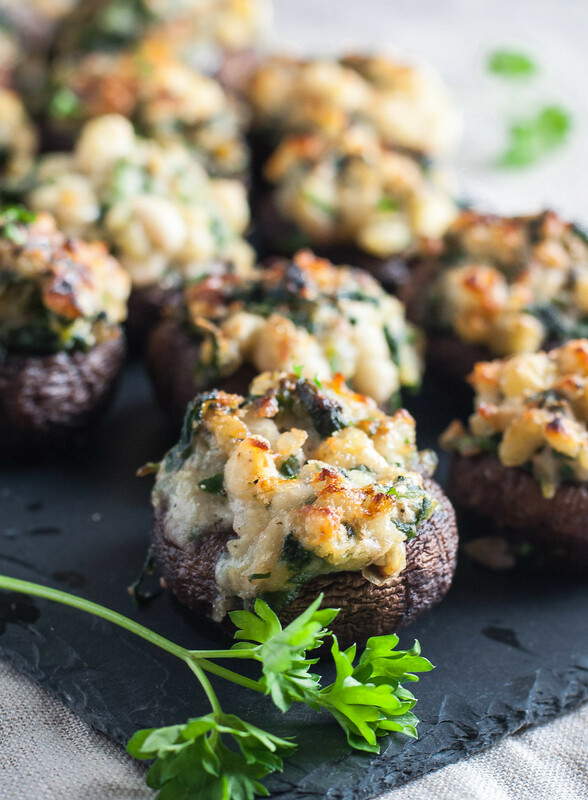 To transport for a party (assuming you'll have use of the oven), make the mushrooms as directed, waiting to drizzle with olive oil and broil with the filling until you arrive. I've eaten these as leftovers after completely finishing them--they look slightly less pretty, but hold up and microwave well for a few days. Love blue cheese! 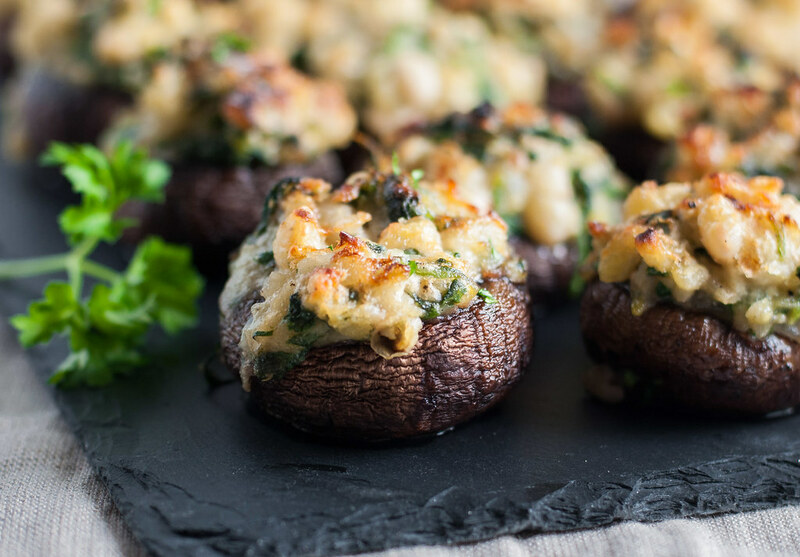 Never stuffed mushrooms with it before though.. what a great (and delicious) idea! Just made this in a portabello mushroom. YUM! Will def be making this in button mushrooms for an appy at my Xmas party! Yay! So glad you approve. Hope your guests all love it, too! I made these for my French in-laws today. They flew off the table! Thanks for the idea. Bon appétit! Given that they’re French, that’s even more flattering! I, of course, assume that every single French person has superior taste to my American palate. Thanks for letting me know!